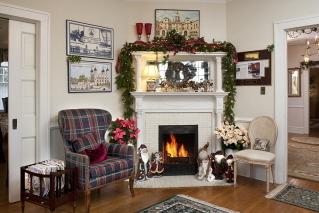 Abbington Green Bed & Breakfast Inn, Asheville NC: Asheville Bed and Breakfast Welcomes the Holiday Season! 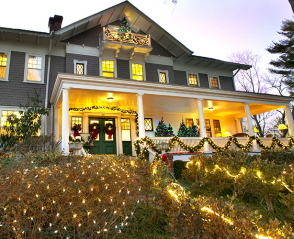 Asheville Bed and Breakfast Welcomes the Holiday Season! Yes, it's beginning...the Holiday Season! My favorite time of year! And we're happy and totally decorated for the season! Magical lights and decorations are everywhere.Warm and friendly greetings await you! Across town from our Asheville bed and breakfast, Biltmore Estate is all decked out in spectacular fashion. This year the theme is featuring the World travels of George Vanderbilt.A guest pass purchased here at Abbington Green gets you a 2-consecutive daytime visit for $55. each... less than the price of a one-day visit purchased at Biltmore's gate. Abbington Green Bed & Breakfast Inn is all aglitter as well. You'll see 11 full-size Christmas trees: some are outdoors on our porches and decks while others are indoors where it's cozy and warm. Our lights are LED so we're responsible from an energy-saving point of view...and LED lights have amazing brightness and sparkle. In the main floor rooms, collections of holiday wreaths, Santas and reindeer are on display. Advent calendars, some dating back nearly 50 years, are in dining room windows. And breakfast is served on Christmas china and crystal for even more sparkle with your mainly local and organic, gourmet breakfast. Just right to put you in the Christmas spirit and put a smile on your face. 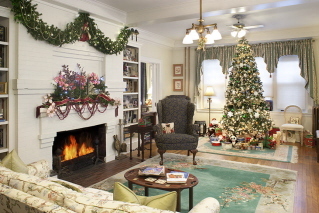 So come see us and experience the magic of the Holiday Season and old fashioned 'comfort and joy' with us! Now through January 7th.